Today I have for a completely different kind of hummus. 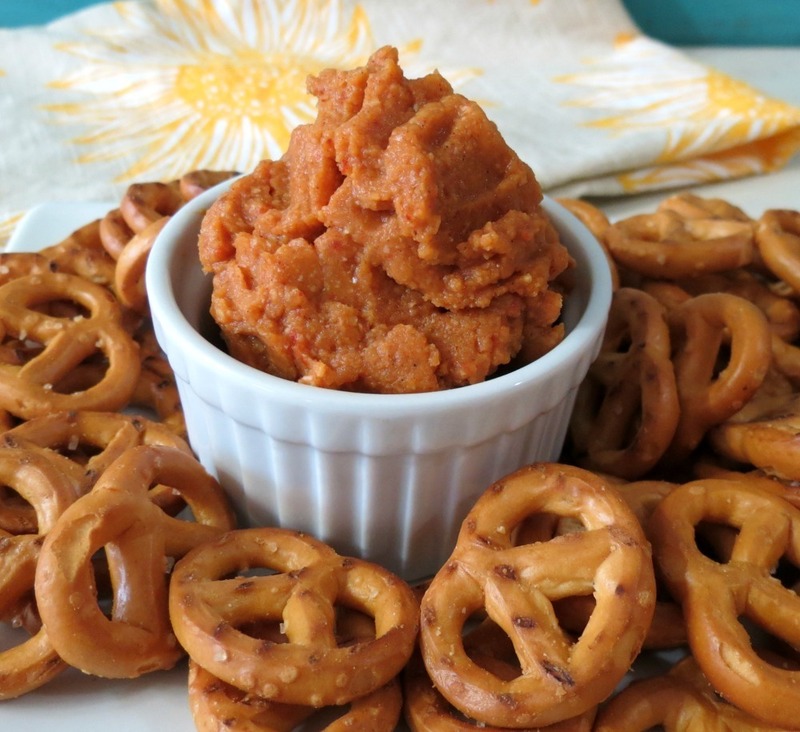 I was looking to make something that packed a little bit of heat, had a smokey flavor and would go fan-tastic with pretzels. So out came the spices and I added a little bit of this and a little bit of that and BAM, my hummus was born. Let me introduce to you my Triple Threat Spicy Hummus. What makes this a Triple Threat? It’s made with Adobo in Chipotle Sauce, cayenne pepper and chili powder. I wasn’t sure about chili powder, but I said why not. So in went the chili powder and boy did it give my hummus a nice deep smokey taste. The hummus does pack some heat, but not much. It’s the kind of heat that you taste afterwards, but not enough to start a 4 alarm fire in your stomach or mouth. I think it’s just perfect. Now by all means if you want more heat, add more chipotle sauce. Yum!! 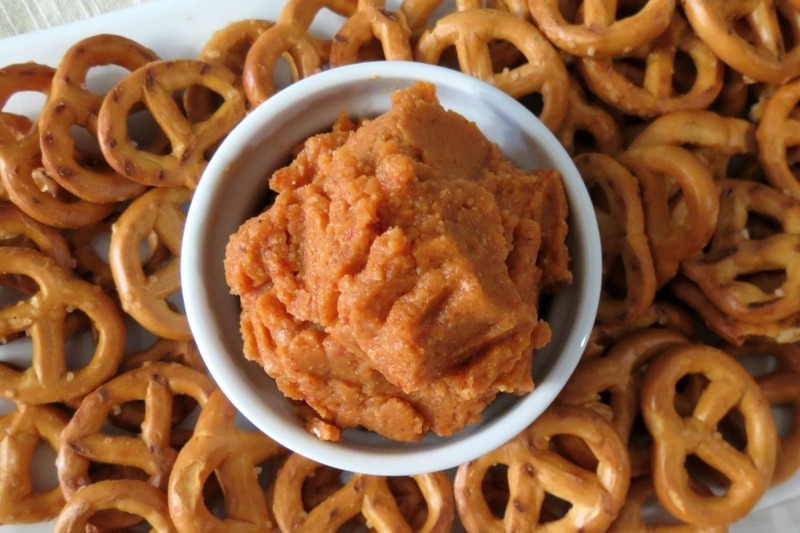 This hummus is perfect with pretzels. 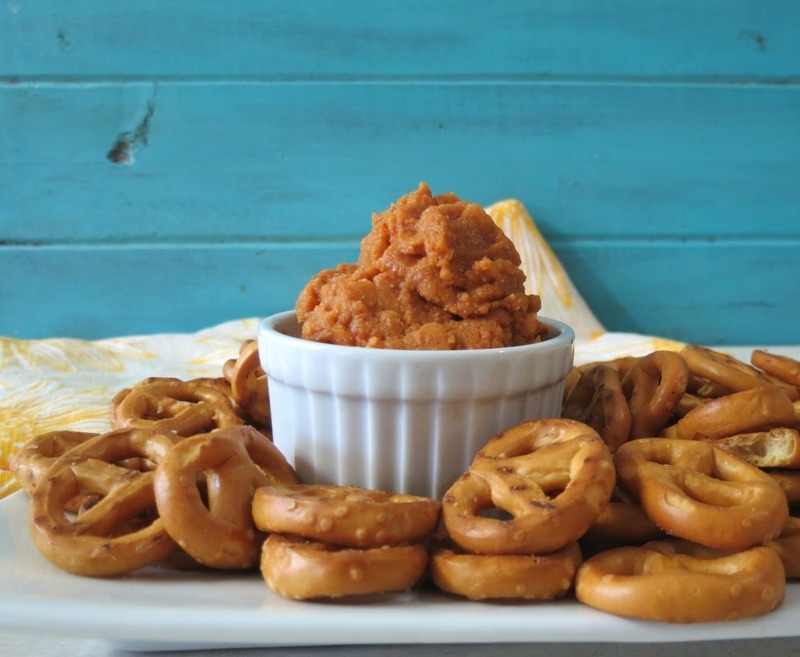 I have had a kaboodle of pretzels lately and they taste ok plain, but I like to dip. I guess you can say I am a dipper. 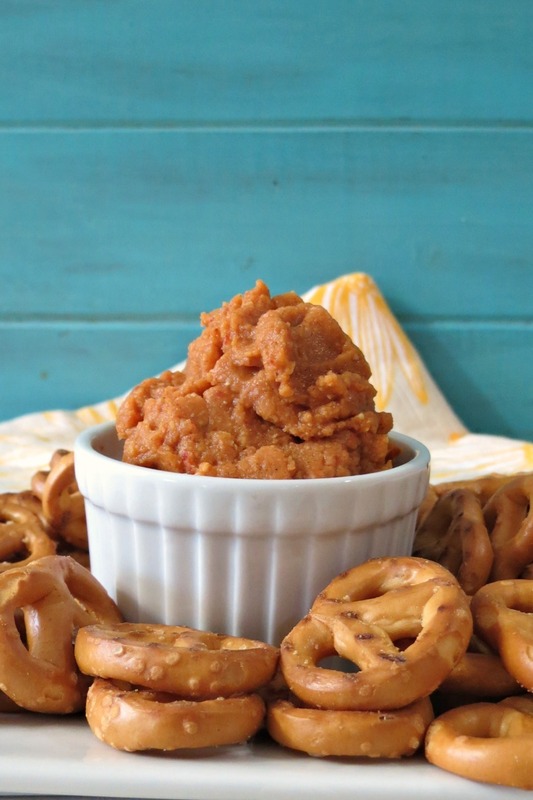 I tried dipping carrots in it, and it doesn’t taste super great, but celery works out super. I mix it up between celery and pretzels. This has been my afternoon snack all week! The hummus contains no fat!! I skip the oil and tahini sauce and just use the juice from the chickapeas to moisten it up and to make it easier to process in my food processor. 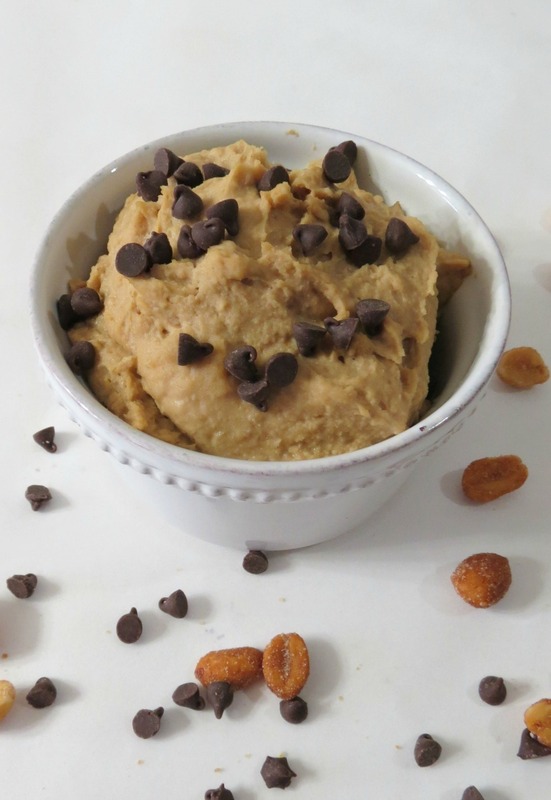 I know I eat a lot of these kind of dips, so the less calories and the healthier it is, the better off I am. Plus one thing i love is that it’s thick! I want it to stick to my pretzels and not slide off. The thicker it is the more filling it is, so a little bit goes a long way. 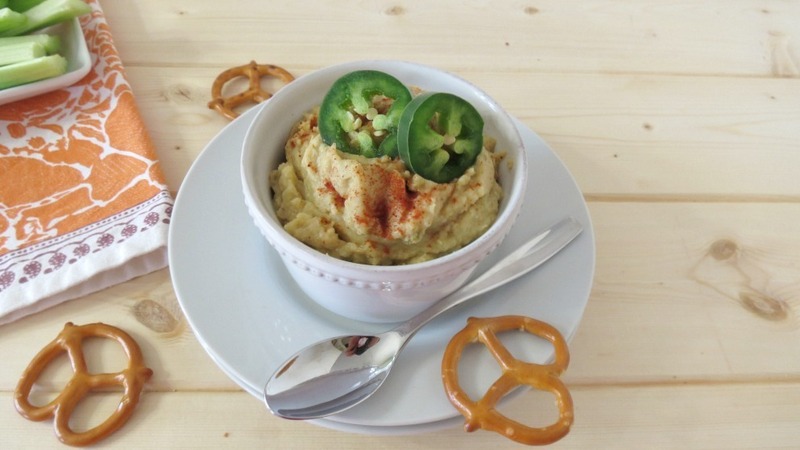 The hummus is just perfect for football season! I think it will please anyone that likes a little spice! Oh and you know what, I bet it would go great in a wrap too! Yummers! 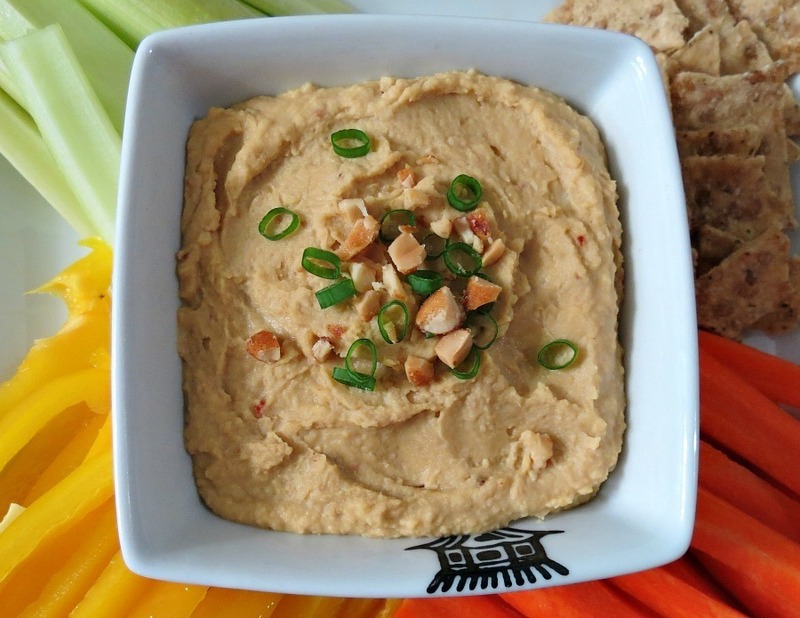 A healthy, non-fat hummus with a little kick of spice and a deep smokey flavor. 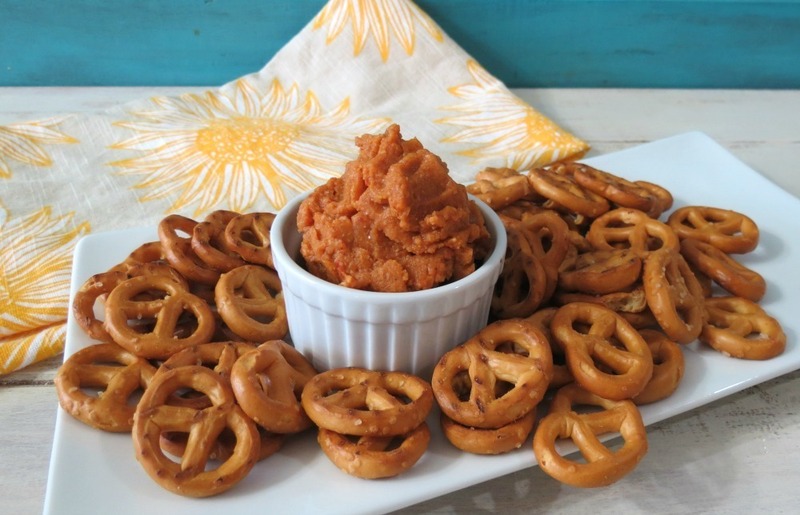 Perfect for dipping celery and pretzels. 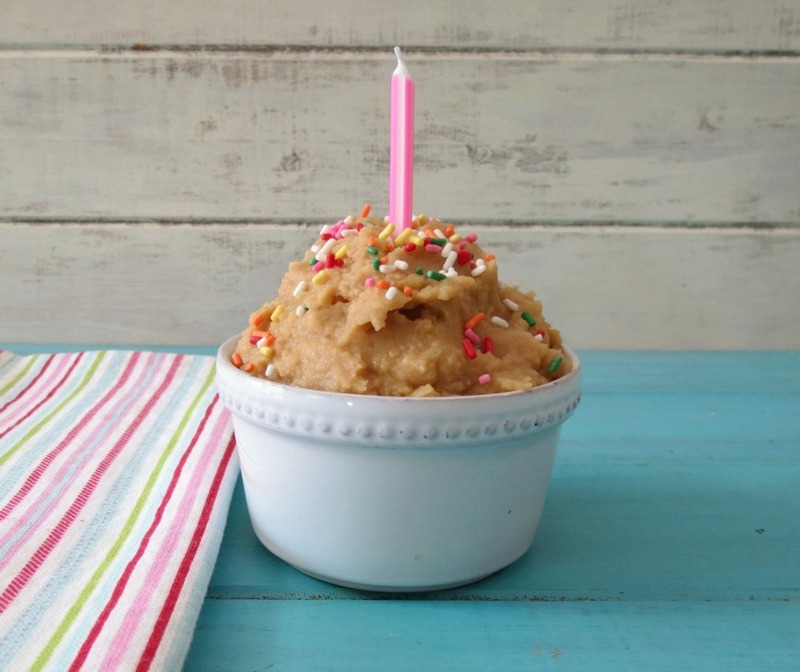 Only 30 calories per two tablespoons. Add all of the hummus ingredients in a food processor (I used my mini food processor) and blend until all mixed well and a smooth consistency. Add 1 tablespoon of reserved garbanzo bean juice at a time if it's hard to mix. I used about ¼ cup of juice. I am so glad I made my hummus. 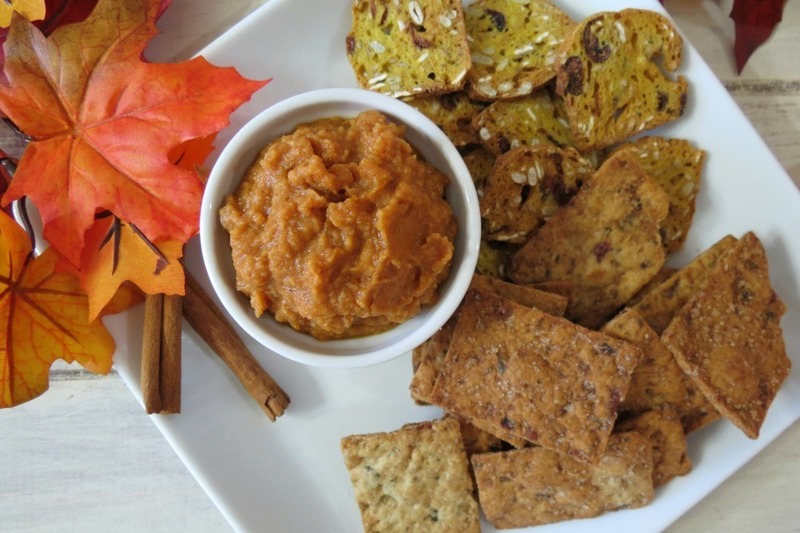 I am always looking for dips and I tend to buy them over making them. Every time I pick up hummus at the store, my Husband says why don’t you make it? I say fine, and then I never do. Finally this past weekend I made some. 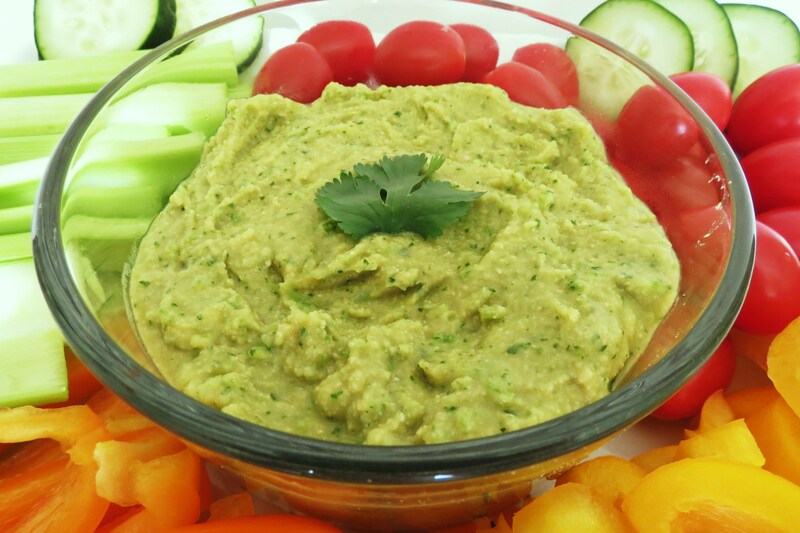 Cilantro and Jalapeno Hummus – I think my all time favorite and a huge hit at parties. I need to re-make it for a picture re-do. So do you have plans for the football game this weekend? Me, I’m going to brunch and then probably blog afterwards. Plus I am sure I will be doing some cooking!! The football game will be on in the background. Gosh, I just wonder how cold it’s going to be? The poor players and people at the game. P.S. 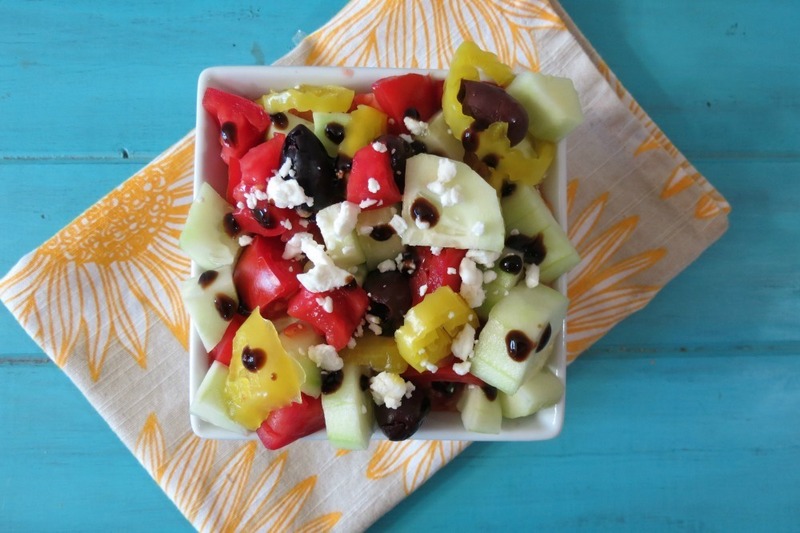 The winner of Van’s Natural Foods Giveaway is, drum roll please….. Comment: Love love love the Buffalo Chicken from you…! Soooo many hummuses sooooo little time! I really LOVE this one today! I love chilis in adobo! YUMMMM! Oh my gosh, I love Chilis in Adobo sauce too!! Yum!! I have been eating so much hummus lately, I should really start making it at home. Yours looks so creamy and delicious! I know I always buy hummus, but it tastes best homemade!